Will Pryce photographed brick buildings for Brick: A World History, which supplemented Pryce's photographs with text by James WP Campbell. 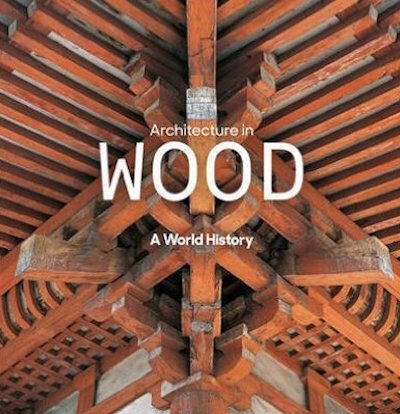 For his similar survey of wooden buildings, Architecture In Wood: A World History, Pryce provided both the photographs and text. Pryce is an excellent photographer, simultaneously capturing the grand scale and intricate details of each building, though his text in Architecture In Wood lacks the historical scope of Campbell's in Brick. As Pryce explains in his preface: "This is not an exhaustive study of wooden architecture's long history... Instead it is a selection of arguably the best buildings and those most representative of important regional traditions." These include two significant Japanese temples: Horu-ji in Fujiwara ("the oldest wooden buildings in the world. The very oldest is the Golden Hall, which dates from 677") and Todai-ji in Nara ("the largest building ever to have been made of wood, the Great Buddha Hall... remains the largest wooden building in the world"). In America, it was released with the alternate title Buildings In Wood: The History & Traditions Of Architecture's Oldest Building Material. The original cover featured the Church of the Transfiguration in Kizhi, Russia; the new edition, published this year, replaces this with a cover image of the To-ji temple in Kyoto, Japan.